Shreddy never had a particular taste for fish, but he’d been in a sour mood for days. The Red-Haired Woman had won their latest skirmish over the orchids. She’d cordoned off the kitchen window with chicken wire. Shreddy rattled the wire, pulling with his claws at the edges. He shoved his face into the few centimeters between wire and wall, wrinkling his nose and squinting his eyes at the discomfort, but the wire didn’t have enough give. Shreddy couldn’t get his head through. As the days passed, the orchids flourished and basked in their new protection. Without suffering chewed leaves and frequent up-rootings, they began putting forth lush purple blooms. Shreddy was infuriated. The perfect promise-shaped buds mocked him, and the delicate spots on their tentatively opening petals made him seethe inside. On the one week anniversary of the Day of the Chicken Wire, Shreddy skulked through the house slashing furniture and knocking petty objects, like pens and paperclips, off the Red-Haired Woman’s desk. But that wasn’t enough. Shreddy was a fat tabby who never cared for mice, or birds, or fish. He liked catnip toys and colorful ribbons; his favorite toy was a kooshball on a string. The Red-Haired Woman dangled it for him, and that was the way it should be. So, he didn’t attack the goldfish for his own benefit. No, he would have preferred to leave the goldfish alone. Yes, the Red-Haired Woman forced him into it. And it was extremely distasteful. He watched the gasping fish flop on the floor, and he struck it a few times with his paw to make it stop. There. That would teach her. Shreddy stretched out on the floor, feeling better. That would have been the end of it if his whimsical cat-mind hadn’t happened on the perfect cherry to top off his sundae of rebellion. He would hide the fish, somewhere inconvenient, for the Red-Haired Woman to find it later. He took the slimy, dead object in his mouth, curling his lips away from the scaly flesh. Fate provided the perfect place — a broken All-in-One. Shreddy dropped the fish in the empty paper slot for feeding paper through, an indentation deep enough to completely obscure the tiny body; then, he stretched out, pleased with himself, on the device’s control panel. The weight of his stripey girth pressed down the “start” buttons for faxing, scanning, printing… everything the All-in-One could do. Before the orchids and before the All-in-One broke, the behemoth machine had been the primary source of contention between Shreddy and the Red-Haired Woman. Against the Woman’s wishes, Shreddy liked to sleep on the control panel of the All-in-One. “Shroedinger!” she would shriek, shooing him off, and he would do his best to ignore her. Nonetheless, it had made his ears twitch and twist around backward when his weight inevitably turned the machine on, inspiring mechanical whirrings, electrical hummings, and sometimes a glowing green light. Shreddy liked the All-in-One much better now it was broken. To Shreddy’s great distress on this day of the Brutally Murdered Fish, the All-in-One leapt to life underneath him. He flattened his ears, trying not to hear the hummings and whirrings under his body, but they vibrated through him, echoing louder in his ears than they ever had before. When the green light flashed, it filled his eyes with ghostly after-image. Shreddy feared it had blinded him. 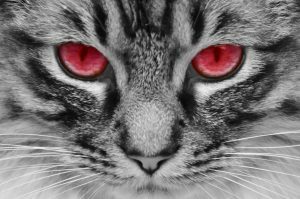 His paws felt weak and unreal to him, but he leapt off the machine, panting like a puppy. It was as if his contact with the machine had electrically shocked him. He would know better than to sleep on a broken All-in-One again. Then, as his vision cleared, Shreddy saw movement in the paper feeder. A tiny gold fin was flapping, and, as Shreddy watched, the once-dead gold fish flopped its way out of the All-in-One. Shreddy tilted his head, looking at the fish quizzically. He had felt its cold, limp, body in his mouth. No heart had beaten in the tiny, scaled breast. The All-in-One powered down, kachunking its internal moving pieces back to their rest states. Had the All-in-One resurrected the goldfish? Shreddy looked back at the gasping fish, dying once again on the floor. As the fish drew its last strained breath, Shreddy felt his own chest constrict. For an instant, he saw through the goldfish’s eyes. How terrible to die as a fish! He would have to find a new place to hide it. More importantly, Shreddy decided he would have to find a more useful beast to test the All-in-One’s powers on. If that machine could help him raise the dead — and possibly channel his mind into the resurrected corpses, using them as his minions — it would give him Great Power. It would give him the power to fit through the chicken wire… He had to find out. Shreddy was not a hunter, but he devoted the rest of the week to tracking and attacking mice. The Red-Haired Woman had never been happier with him, but he was unable to enjoy her praises. He daily worried that she would throw the broken All-in-One away. He had to hurry. The first three mice were a disaster. After resurrection, despite Shreddy’s immense concentration, each of them scurried away. In his fazed, drained state brought on by the noise and lights of the All-in-One, Shreddy was unable to recapture the raised mice or take control of them. He experienced a strange dual existence, each time, until the mouse re-died. 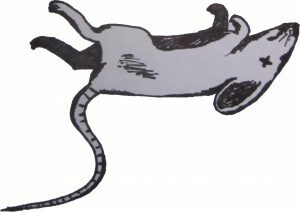 This didn’t take long, since the mice were generally quite panicked by their experience being captured by Shreddy, not to mention deeply confused by the metaphysical experience of dying and resurrecting as part cat. Shreddy lay on the floor, eyes dilated and ears flattened, viscerally experiencing a mad dash through the ductwork or the unpleasantness of being caught by another cat, once back outside. He hoped his attacks to the brainless beasts were equally frightening. They certainly deserved it for what they were putting him through. On the fourth mouse, Shreddy had a stroke of luck. Although, it was a mixed blessing. Losing his patience with the tedium of catching mice, Shreddy had taken his aggression out on his soon-to-be host: the mouse’s back legs were broken, completely crushed by Shreddy’s horrific (and splendorous) mauling. Since the mouse couldn’t run away, Shreddy was able to properly focus on it and take the time he needed to learn dominion over his tiny, pained minion. However, Shreddy couldn’t take the pain for long — as he controlled the mouse, practicing using its body, he experienced the excruciating pain it felt in its broken limbs. Shreddy put the miserable beast out of its misery. Out of his misery. He would be able to use the next mouse properly. The taste of orchid greens was nearly his again. He could almost feel the fleshy plants between his teeth. Mouse number five proved harder to control. Although Shreddy could see through its eyes and shared partial control of its body, the mouse proved to have a mind of its own! Shreddy had to smack it down, dizzyingly, with his paw. Dealing and receiving the same claw-filled blow stretched his perception of reality in a mind-blowing way. He was walking on both sides of the thin line dividing pleasure and pain. Unfortunately, the mouse re-died during the momentous experience. Shreddy deftly resurrected it again, making mouse number five also mouse number six. After a quick repeat of the same interchange, mouse numbers five and six also became mouse number seven. The mouse, who Shreddy had come to think of as “Orchidbane,” was much more pliable to Shreddy’s control after its third death and resurrection. Fortunately, Shreddy had remembered to treat the mouse carefully while killing it, and Orchidband was still in good (albeit less than mint) condition. Shreddy spent the rest of the afternoon curled up in the kitchen sink, resting after his valiant struggle. He left Orchidbane quivering in the All-in-One. As Shreddy fell heavily into the abysses of sleep, he dragged Orchidbane with him. Their dreams mingled. The hunter was hunted, and the hunted was horrified by his power. The smell of cheese wafted through the dual dreams, both delighting and disgusting them. When nightmare phantoms reared, their instincts conflicted: fight and flight, they said. Shreddy awoke less rested than when he’d fallen asleep. It was time to get this job done. He stalked back to the All-in-One, where he extracted Orchidbane from the paper feeder. Delicately, he carried himself (well, his mouse-form) inside his own mouth. It was warm and wet inside. He leapt lightly to the kitchen counter and placed the mouse under the windowsill. It was an easy jump for a cat from counter to sill, but Orchidbane had to scramble up Shreddy’s back, using the cat as a ladder to reach the height of the offending chicken wire. Shreddy’s brain felt like it did a back flip trying to understand the sensation that mouse paws on a cat back — all controlled by the same mind — created. Shreddy watched intently with his own cat eyes as his Orchidbane body squeezed through one of the holes in the chicken wire. Nose twitching, Orchidbane skittered across the windowsill and up to the first orchid pot. With a little leap, he landed in the moist potting soil. He sunk his claws into the base of the lush orchid stem (Shreddy gave a sigh of contentment) and stared up the length of the flower. Orchids were trees to him. One by one, Orchidbane climbed the orchids until they drooped downward, eventually breaking their stalks. Then, biting deep into the green flesh (another catly sigh with each bite — who knew orchid’s would taste as sweet to mouse teeth?) he dragged the orchids, flower end first, toward and through the chicken wire. Pulling the flowers through the inch-wide wire holes stripped their leaves and mangled them. Shreddy didn’t care. Once his faithful mouse was done, Shreddy feasted on them. He gnawed the stalks until they became white and stringy. He batted the misused blooms about, chasing them from end to end of the linoleum kitchen floor. He sated himself after his long and unwillingly endured abstinence from orchids. The Red-Haired Woman returned from her day at work to find Shreddy deep asleep, wound in orchids. The mouse, Orchidbane, had been abandoned, carelessly, in a stupor on the counter. The Woman shrieked when she saw him — both Shreddy and the mouse — but, she would have been hard-pressed to decide which distressed her more: destroyed orchids or vermin in her kitchen? Shreddy slept better after the mouse was destroyed. His brain was washed clean by pure, feline dreams. Blinking his eyes, Shreddy roused to the world slowly the next morning. It was uncatly of him to sleep the whole night through, never rearranging himself to find better comfort or moving from spot to spot, as if sampling the quality of sleep in each. Yesterday’s antics had drained him, and so he had slept the sleep of the dead. The orchid remains were gone. He noticed that first. Then, he realized the chicken wire had been removed. He leapt into the window to enjoy his hard earned right. It should have been his simply by nature of his cathood. Cats own window sills. Suddenly, Shreddy felt the diminished state of his existence. Where he had lived in two bodies, he now lived in one. The Red-Haired Woman had killed his other self! No matter. He would make another self. Perhaps he would make two and live a threefold life. Or four? His eyes dilated, possessively, as he thought of the possibilities. He felt the urge to sleep on the All-in-One while he planned his nefarious deeds. Unfortunately, during the night, Shreddy’s fears had been realized. The Red-Haired Woman had moved the All-in-One out to the curb with the trash and recycling. When he found it there, his heart was nearly broken. It was as if the Red-Haired Woman were trying to kill the tiny parts of him that were yet to be born. He would have to hurry before the garbage truck came. He would kill and resurrect as many mice as he could. (The idea made his head spin.) No! He would resurrect a bird and feel what it’s like to fly! Frantically, Shreddy climbed the cherry tree in the front yard and crouched in its crotch. He waited impatiently for birds to fly by, and when they did he leapt haphazardly at them, paws flailing. By sheer luck and the element of surprise, he managed to knock a sparrow out of the air. Although, he fell awkwardly from the tree with it. Despite the urban myth, cats don’t always land on their feet. Especially if they are overweight and careless. Three more houses, and the truck would be here. Shreddy stuffed the bird in the paper feeder, and bounced onto the control panel. His stomach lurched in preparation for the leeching sensation as his mind was funneled into the re-rousing bird. Shreddy jumped off and on again, slamming the control panel with all his portly weight. Nothing. (One more house.) He batted his paw against the large green buttons. Nothing. The garbage truck parked in front of the Red-Haired Woman’s house. The garbage man swung off of the back of the truck and lifted the trash can, deftly emptying it into the back of the truck. Shreddy crouched possessively on his All-in-One, but the garbage man shooed him away. Shreddy had to relinquish his beloved electronic box. He watched the power of his necromancy crash into the pile of common rubbish. As the truck and All-in-One pulled away, Shreddy counted up his little minions in his mind: one fish, three mice that ran away, one mouse with broken legs, and three resurrections for Orchidbane. Eight. And one life of his own. Nine. Of course he couldn’t raise the sparrow, not without sacrificing himself. He didn’t notice the unplugged power cord, hanging uselessly, out of the back of the garbage truck driving away. That evening, the Red-Haired Woman greeted Shreddy warmly. “I don’t know how you did it,” she said, “but chicken wire won’t do me any good if you can pull my orchids through it.” She was carrying a new potted plant, which she set in the kitchen window. She had bought a catnip plant to replace her orchids.